It is scientifically proved that fish dishes are tasty, nutritious and healthy. Fish contains Omega-3 fatty acids wich have a favourable influence on health - they help to prevent heart deseases, bends, neural disorders and tumours. Omega-3 fatty acids are irreplaceable because our organism cannot synthesize these acids itself. Hence the healthy qualities of fish. Recipes Herring casserole with salt pork Ingredients 800 g boned herring 2 onions 250 g salt pork salt, pepper and dill Directions Place boned herring in oven pot in layers. Put onion and pieces of salt pork between the layers. Add some salt, pepper and dill between the layers. Heat oven to 200°C and cook until ready. Colourful sprat casserole with vegetables Ingredients 700 g fresh sprat 2 tablespoons oil 2 onions 1 tomato 200 g broccoli 150 ml water salt and pepper 1 paprika dill grated cheese Directions Grease oven pot with some oil. Lay clean sprat in oven pot in layers alternately with onion, broccoli and tomato. Add salt, dill and pepper between the layers. Pour some water in the pot, the casserole will be juicier. Cover on top with paprika, tomato slices and broccoli. Heat oven to 200°C and cook for half an hour. At the end of cooking time sprinkle grated cheese on top. Many scientific surveys have proved that fish diversifies our everyday diet and Omega-3 fatty acids benefit our health. Herring is a perfect product for preparing tasty, nutritious and healthy dishes. Oil-cooked herring Ingredients 800 g boned herring 100 ml oil garlic salt freshly grounded pepper Directions Lay boned herring in oven pot in layers. Put pepper, garlic and salt between the layers. Pour oil on top of the herring. Heat oven to 200°C and cook about 40 minutes. The result is a tasty, nutritious and healthy herring casserole with crispy crust. Recipes Herring casserole with salt pork Ingredients 800 g boned herring 2 onions 250 g salt pork salt, pepper and dill Directions Place boned herring in oven pot in layers. Put onion and pieces of salt pork between the layers. Add some salt, pepper and dill between the layers. Heat oven to 200°C and cook until ready. Colourful sprat casserole with vegetables Ingredients 700 g fresh sprat 2 tablespoons oil 2 onions 1 tomato 200 g broccoli 150 ml water salt and pepper 1 paprika dill grated cheese Directions Grease oven pot with some oil. Lay clean sprat in oven pot in layers alternately with onion, broccoli and tomato. Add salt, dill and pepper between the layers. Pour some water in the pot, the casserole will be juicier. Cover on top with paprika, tomato slices and broccoli. Heat oven to 200°C and cook for half an hour. At the end of cooking time sprinkle grated cheese on top. Many scientific surveys have proved that fish diversifies our everyday diet and Omega-3 fatty acids benefit our health. Herring is a perfect product for preparing tasty, nutritious and healthy dishes. 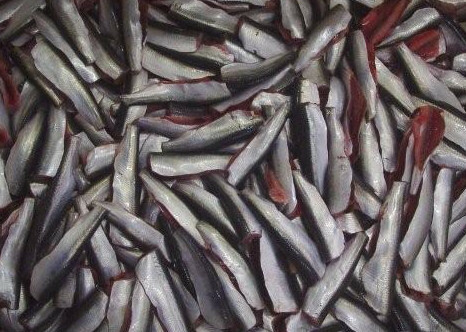 Oil-cooked herring Ingredients 800 g boned herring 100 ml oil garlic salt freshly grounded pepper Directions Lay boned herring in oven pot in layers. Put pepper, garlic and salt between the layers. Pour oil on top of the herring. Heat oven to 200°C and cook about 40 minutes. The result is a tasty, nutritious and healthy herring casserole with crispy crust. It is scientifically proved that fish dishes are tasty, nutritious and healthy. Fish contains Omega-3 fatty acids wich have a favourable influence on health - they help to prevent heart deseases, bends, neural disorders and tumours. Omega-3 fatty acids are irreplaceable because our organism cannot synthesize these acids itself. Hence the healthy qualities of fish. It is scientifically proved that fish dishes are tasty, nutritious and healthy. Fish contains Omega-3 fatty acids wich have a favourable influence on health - they help to prevent heart deseases, bends, neural disorders and tumours. Omega-3 fatty acids are irreplaceable because our organism cannot synthesize these acids itself. Hence the healthy qualities of fish. Place boned herring in oven pot in layers. Put onion and pieces of salt pork between the layers. Add some salt, pepper and dill between the layers. Heat oven to 200°C and cook until ready. Grease oven pot with some oil. Lay clean sprat in oven pot in layers alternately with onion, broccoli and tomato. Add salt, dill and pepper between the layers. Pour some water in the pot, the casserole will be juicier. Cover on top with paprika, tomato slices and broccoli. Heat oven to 200°C and cook for half an hour. At the end of cooking time sprinkle grated cheese on top. Many scientific surveys have proved that fish diversifies our everyday diet and Omega-3 fatty acids benefit our health. Herring is a perfect product for preparing tasty, nutritious and healthy dishes. Lay boned herring in oven pot in layers. Put pepper, garlic and salt between the layers. Pour oil on top of the herring. Heat oven to 200°C and cook about 40 minutes. The result is a tasty, nutritious and healthy herring casserole with crispy crust. Healthy Food It is scientifically proved that fish dishes are tasty, nutritious and healthy. Fish contains Omega-3 fatty acids wich have a favourable influence on health - they help to prevent heart deseases, bends, neural disorders and tumours. Omega-3 fatty acids are irreplaceable because our organism cannot synthesize these acids itself. Hence the healthy qualities of fish.